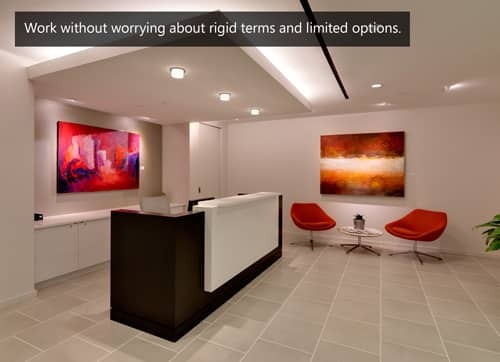 Unlike traditional office space, AdvantEdge Workspaces provides customizable terms that will not lock you into an office space for longer than you feel comfortable. Additionally, we are willing to physically reconfigure our offices to create a design that will be suited to your business. Our flexible model is why so many of our clients latch on to the AdvantEdge community and choose to stay with us for decades. We make sure to provide solutions that will allow your business to grow, whether that means expanding or transforming your office space or relocating to one of our larger offices or office suites. Click the button below to learn more about our workspaces. With AdvantEdge Workspaces, you enjoy the full complement of resources associated with owning your own office building without the cost and concern of maintenance. AdvantEdge provides a range of conference rooms that will meet your needs whether you are having an intimate meeting with two other people or a large-scale conference with fifty. Additionally, our conference rooms are designed with flexibility in mind, and can be reconfigured at a moment’s notice. Our meeting spaces are also equipped with state of the art, easy to use technology to enable conference calls and presentations. Our kind and capable staff is always on hand to help you set up and make sure these meeting run smoothly. The strength of AdvantEdge is in our willingness to do whatever it takes to help you and your organization succeed. We promise to join and assist you in any way we can regardless of the obstacle or opportunity that arises. Schedule a tour today and visit our innovative workspaces that can help your business succeed.